A pair of facilities on the A12, staggered some distance apart. The northbound restaurant as a Little Chef. Today's Feering northbound started as a garage in the 1950s. This was eventually joined by an independent diner, which in the 1980s was taken over by Happy Eater. It had stone-effect walls, and a Happy Eater weather vane which outlived the restaurant. A Travelodge was added in 1991. 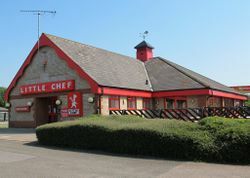 In 1996 the restaurant became a branch of Little ChefHistory. In May 2015 this site received the Wonderfully British refurbishment, gaining a Burger King in the process. In January 2017, Euro Garages purchased the site and in January 2018 the new owners lost the rights to the name and it became EG Diner. In August 2018 the EG Diner and Burger King both closed. 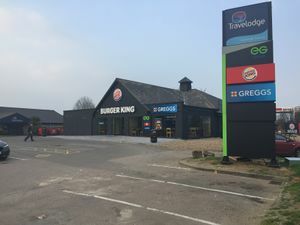 The building was refurbished and reopened in January 2019 with Burger King and Greggs stores. There was a pub at the southbound service area called The Trowel and Hammer. This had to be completely re-built following the dualling of the A12 in the 1950s, and it re-opened with new garage facilities. This became The Spaniard, but the pub aspect closed in the 1980s and was demolished.